Everything changes. Nothing stays the same. The only thing constant in this world is the constancy of change. Learning this lesson from more than one angle might be the single biggest secret to living a more peaceful, mindful, and simply full life. Everything changes. There is an obvious application of this principle when times are hard. This too shall pass. When you’re struggling to just stay afloat, the struggle is often made worse by the irrational belief that this is the new normal. Negativity is the fabled perpetual motion device, and it is difficult to stop that motion once you get it going. The key to shutting off that infernal machine is change. Change is inevitable, and that is just as true for the hard times as for anything else. A somewhat less obvious, though still very real application is for when times are easy. Look ahead. I don’t mean to obsess over the future - that is unhealthy - but be mindful that the future will come, and it may not be the same as today. It is the story of the grasshopper and the ant. Don’t let the ease of spring lull you into laziness so that you become ill-prepared for the difficulties of winter. It was no secret that spring would not stay. Everything changes. According to the Pali canon, the Buddha once said, “upadhi dukkhassa mūlanti”, which can be roughly translated as “attachment is the root of suffering.” We tend to cling, and that tendency to cling is the leading cause of our own pain. We want things to be a certain way, or to not be a certain way, and we either hold on tightly when we have what we want, or we become convinced that what we don’t want is holding tightly to us when it is happening. We forget that these things change and, in forgetting, we are either ill-prepared for the change when it occurs or we become convinced that change will not occur and we are stuck. Everything changes. Nothing stays the same. If we learn nothing else, learning that will help us move toward the right direction. That is not to say that change will always go in the direction we desire. It often will not, but even the worst change will inevitably lead to yet more changes, and we can work to help the process. It would be foolish to believe that we could govern all changes, but we can guide the process, and we can prepare for those times when things will not go our way. Most of all, we can cherish this moment, completely mindful of life right now so that we do not waste it and regret when it is gone. I am reminded of the constancy of change as we begin the tedious process of house hunting and gathering boxes. We are renting our current home, and the owners have decided to sell. I’m not exactly surprised, though we were hoping to get a little more time out of it before we crossed this particular change. They offered us the possibility of buying, but I’m afraid I understand all too well why they are selling. It has become abundantly clear in recent months that this house needs more work than I am willing to put into it, and I am certain that the owners have arrived at the same conclusion. So we prepare to move, and we are strongly leaning toward making this one a fairly large change. We will probably leave Phoenix completely and go to one of the surrounding towns. To be honest, neither of us works in Phoenix anyway, so it’s really about time that we made that change. It will be interesting learning new neighborhoods, not to mention learning new routes to get anywhere, but this is what living is all about. These practical applications are the reason for what we learn. Everything we do in life is an opportunity to learn, but if we’re not using what we learn then what is the point? We could sit on the side of a mountain and contemplate the universe, or we could go out into life and learn new roads. Both can be teaching moments, and both have their value, but I believe that more people will get more out of the latter. There have been some great teachers who have provided valuable knowledge gained from universal contemplation, but the value of that knowledge would be severely limited if there were not people in the world living and acting upon it. So we go into the world and we live. We go through changes, and we change as a result. We may or may not know that there have been thinkers and dreamers, philosophers and preachers who have taught us about change, its inevitability, and what we can do with it, but we know all about change because we live with it. 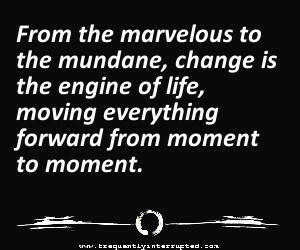 From the marvelous to the mundane, change is the engine of life, moving everything forward from moment to moment. Know that change is coming, and live your life with that understanding. You’ll find that change can be easier to work with if you do work with it. Learning with a true understanding that everything changes is the first step toward inner peace, and inner peace is the first step toward everything else. Everything changes, nothing stays the same, and that is how life happens.